While his words offer a challenging theme for our annual meeting, for Paul, these words are a confession. In his own life, Paul stepped away from conformity to embrace a life of transformation. In doing so, he joined the original disciples – ordinary people who had stepped away from conformity so that the power of the Holy Spirit could take hold. And together with Paul, their transformation would accelerate as they launched the greatest mass movement the world would ever see. For the early church, the vision articulated in the Gospels became the people’s expectation. And as it did, their hope became anticipation. I believe that this is how the future is written; and this is how history is made: by envisioning new possibilities and acting on them as if they were inevitable 1. Indeed, that’s just what Phyllis Tickle is saying in her book, The Great Emergence. That’s what Robert Putnam concludes in his recent tome, American Grace. That’s what emergent church leader Brian McLaren declares with every sermon and essay. And most recently, that’s the central thesis of Diana Butler Bass’ just published tour de force, Christianity after Religion – The End of Church and the Birth of a New Spiritual Awakening. Engaging transformative hope; harnessing transformative power. . . . I can think of no better way to describe what the Mass Conference has been working toward. Allow me to lift up some of the ways your Conference is engaged in a ministry of transformation. I’ll begin with the fact that in the Mass Conference, no church needs to be alone; no pastor needs to feel isolated. For over a decade, your Conference staff and leaders have been building a covenantal web of relationships that grow out of Jesus’ call to discipleship – enabling congregations, lay leaders and pastors to envision and live into a faithful, bold and resilient future. Raise your hand if you have at least heard about Super Saturdays? Now: keep your hand up if you’ve attended one. . . . Thank you. How much stronger will be when next year, all our hands will stay up! Anyone who has been to a Super Saturday knows that the Conference is convening these gatherings so that church leaders and pastors can tie into one another and benefit from each others’ best practices. And one more thing: your church is more likely to grow! That’s why we launched the Sustaining Pastoral Excellence Endowment Campaign a year ago – to assure that this transformative program will continue for future generations. And one year into this five year Campaign – we’ve raised nearly One Million Dollars. You’ll hear more about this Campaign after lunch from Andy Gustafson – but for now, let me say that as a delegate to this Annual Meeting, if you follow up on only one thing, I hope you’ll return to your congregation and convince your church leaders to contribute to this Endowment Campaign. Something else you need to know: In the coming year or so, 19 other UCC Conferences will be initiating their own pastoral excellence programs. Not only have we changed the landscape of ministry in the Mass Conference, we’re changing it throughout the UCC! And none of this would be happening were it not for the initiative of your Massachusetts Conference and Sue Dickerman’s tireless efforts! Let’s take a moment to recognize this accomplishment and thank Sue for her extraordinary leadership. The Pastoral Excellence Program isn’t the only denomination-wide initiative begun in your Conference. 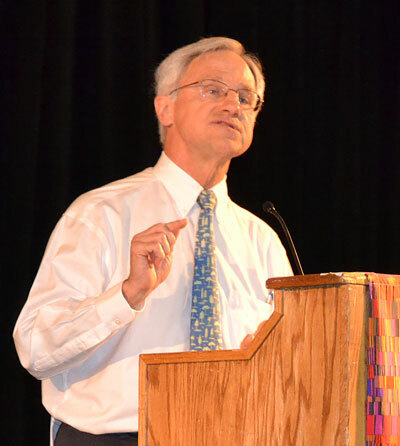 The UCC’s Open and Affirming movement began when this annual meeting passed an Open and Affirming Resolution in 1984. Now, with 116 ONA churches, our Conference has well over 10% of all the ONA churches in the UCC. And we’re now increasing that number by 10 congregations per year. In 1984 this Annual Meeting envisioned new possibilities, and we acted on them as if they were inevitable. Now I want to share some of the ways we are doing that today. Who is God calling us to be and become? The first two questions are best answered through an assessment. Knowing who we are today and who is our neighbor allows a congregation to discern God’s call, embrace a vision, and take action. We see a day in the not too distant future when the majority of congregations in our Conference will regularly engage in assessment and vision every 3-5 years. Given the pace of change in our world and culture, for a congregation to remain vital, it is essential to regularly wrestle with these questions so that the actions we take and the differences we make in the world are what God would have us do. Let’s stick for a moment with the question, “Who is our neighbor?” For 11 years the Mass Conference has supported Hispanic Ministries under the faithful leadership of Cesar and Lisa de Paz. As the demographic make-up of many urban neighborhoods is changing, Cesar has been busy developing leaders who are gathering congregations who hunger for a church like the United Church of Christ. Later this afternoon you will hear more about this program. Its future depends on your congregation carving out a line in your mission budget to support Hispanic Ministries. I believe it’s possible for the 375 congregations of the Mass Conference to fund this Conference-wide mission project on an ongoing basis. But for that to happen, each of you need to return to your mission committee as an advocate. This is another example of what I said earlier: we are building a covenantal web of relationships that enable congregations, lay leaders and pastors to envision and live into a faithful, bold and resilient future. I’ve already lifted up the impact of the Mass Conference on the whole of the UCC. Twenty eight years ago we launched the ONA movement. And now we are changing the culture of ministry throughout the UCC by advancing the Pastoral Excellence Program. Here’s a third example. It began with the founding of our Environmental Ministries group in our Mission and Justice Commission well over a decade ago. It continued 4 years ago when almost 100 churches rang their bells 350 times. Then 3 years ago, this Annual Meeting became the first church-body in America to pass a resolution calling upon our elected leaders to commit to policies that will reduce the amount of carbon dioxide in the atmosphere to below 350ppm. For the last 3 years, your Conference has convened the environmental ministry representatives from all New England Conferences. This is the group that created the Ecumenical Lenten Carbon Fast that has engaged thousands of people all over the world. And just a week ago, leaders from all 7 New England diocese of the Episcopal Church joined us. And last night we presented our first Green Congregations Awards. Have a look at your Delegate Materials – pages 9-11 – to learn how churches are tilling their church yards into community gardens, blessing bicycles, composting, installing solar panels and more. Building on this momentum, I want to draw your attention to two things. The first is our impact on the denomination. Last year, General Minister and President Geoffrey Black told us that in articulating its overall purpose, the UCC would be including a commitment to a sustainable earth – and he thanked the Mass Conference for our leadership. Next April, we hope that the 5,000 UCC congregations across America and one million UCC members will all focus on the environment through what will be called: "Mission 4/1 Earth: 50 Great Days." And last October, I was asked to be the lead person in drafting a pastoral letter to the whole of the UCC focusing on "Climate Change and the Vocation of the Church." The letter will take a que from what Bonhoeffer wrote to initiate the Confessing Church (“The Barmen Declaration”) and what Bishop Tutu and others wrote to bring an end to Apartheid (“The Kairos Document”). Wendell Berry, Bill McKibben, the head of the National Council of Churches, the World Council of Churches, and a dozen other scholars have already expressed their support for this effort. And let me just say personally how grateful I am for the encouragement and support that this Conference has provided in this ongoing effort. Thank you. Now there is one other important point here. I mentioned that now there is extensive cooperation between the UCC and the Episcopal Church throughout New England on environment and climate issues. In the very near future, I’m confident we will be combining our work with the New England Lutherans, Presbyterians and Methodists – all of whom are already committed. This is important. I believe that our common call as people of faith to witness on behalf of creation will also lead us to transcend, overcome, and set aside our denominational divisions. Believe me, I am not naive about the boldness of this claim. But as the time-horizon to preserve creation closes in, the only division in the church that will matter is between those who reject science and those who take responsibility for what we have done with the freedom God has given us. Bridging denominational divisions – doesn’t that sound a lot like what we find in the founding vision of the United Church of Christ? OK. You’ve now heard examples of how the Mass Conference is all about transformation. Now I want to point out something important that’s easy to miss. Some of these transformations are being lived out in our local churches. Some are being lived out between and among our UCC congregations throughout the Conference. Some transcend our denominational boundaries – and almost every congregation in this room can go down the street and do a better job of accomplishing God’s mission by forming a partnership with another church. And finally, some of these transformations are impacting the whole of the church – and not just the UCC. Each of you – and each of your congregations – are part of every one of these contexts. Your congregation’s active participation in Annual Meeting, in our two yearly Super Saturdays, and in other conference gatherings will connect you to the wisdom and experience of dozens of other churches. Your generous giving to Our Churches Wider Mission and to Fellowship Dues strengthens those bonds, and fuels the Conference to continue weaving that web of connections. And one thing more. Your participation and financial support allows the leaders of the Conference to continue to discern and describe the horizons to which our Still Speaking God is calling us. I began by noting that—like the early church—our Conference is all about engaging transformative hope and harnessing transformative power. The early church was born into an urgent time. Our time is no less urgent. Like many of you, I often turn to prophets like Martin Luther King to increase my understanding of how God may be calling me to act. King’s example was crucial for me as I discerned God’s call to be arrested in front of the White House last summer. His example gave me courage when our time in the Washington DC jail was extended to 3 days and 2 nights. And King’s example gave me hope that our witness would succeed in delaying and perhaps preventing the construction of the Keystone XL Tarsands pipeline. Again – our time is no less urgent than was Martin Luther King’s time. "When the church starts to be the church it will constantly be adventuring out into places where there are no tried and tested ways. . . . wherever [the] church is true to its mission it will be experimenting, pioneering, blazing new paths, [and] seeking [ways] to speak the reconciling Word of God to its own age." May it be so for the church in our age – the church God is calling us to become.